As digital marketers, we tend to experiment with new techniques on social media platforms. When one of those techniques seem to work like a charm it sends us over the moon! We tend to then add it to our list and use it over and over again expecting the same results each time. We become so enthused about finding the next big technique that we don’t notice that that first technique we still use isn’t working so well. Keeping this in mind, we decided to look back a few years on tactics that were working for us but aren’t quite as effective anymore. Here is a list of three social media tactics you need to retire, and what you should do in place of them. There is not one set way to use the influencer marketing technique. However, linking to an influencer or quoting that person as an expert with the hopes that they’ll share your content is not the way to go. By doing this, you typically aren’t adding any value to their life so you tend to go unnoticed and pass right under their radar. The worst thing about this technique is that it makes the content you are posting less useful to your audience. This could be due to the fact that the influencer you are using hasn’t worked in the relevant industry for years, or some other reason. The point is, it just doesn’t work anymore. If your answer to this question is yes, then you’re in good shape. Answering yes means that their content is a great fit for your audience so it will not only benefit them but the influencer as well. This leads to the increased likelihood of influencers promoting your post. Don’t get us wrong, images definitely still drive engagement, but video is becoming more and more important each day in the social media world. By next year video will not only consumer 69% of consumer internet traffic but watching videos about products is going to be four times more popular than reading about them. The real kicker, though, 25% of consumers will lose interest in your brand if it doesn’t have a video. If you haven’t already integrated video into your content marketing strategy, now is the time to get started on that. When you look at Facebook, a majority of the videos are viewed without sound. So, creating video content that can stand without sound is crucial for your content strategy. On the other hand, when you create videos for say, YouTube, incorporating audio into your video is a must. Not only does sending out an automated message to new followers lack personalization, it shows them that you don’t really care about the time they took to follow you. It also says that you care more about what they can do for you rather than what you can do for them. Have real and meaningful interactions with your followers. Like and retweet their content. If they mention your brand, send a personal reply. This strategy will require more time, energy, and resources than automated messages did. However, the end result will benefit your brand substantially. Digital marketers are always looking for new techniques to up their social media game. However, once we end up finding one that works we tend to overuse it. Keep these three retired social media tactics in the back of your head next time you’re posting for your brand. 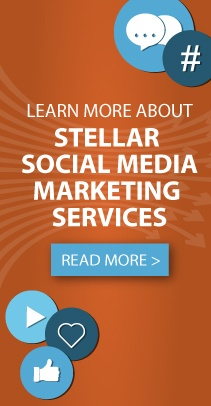 Stellar Blue has an amazing team that can help you with your social media plans and techniques. Contact a Stellar representative today to find out more.